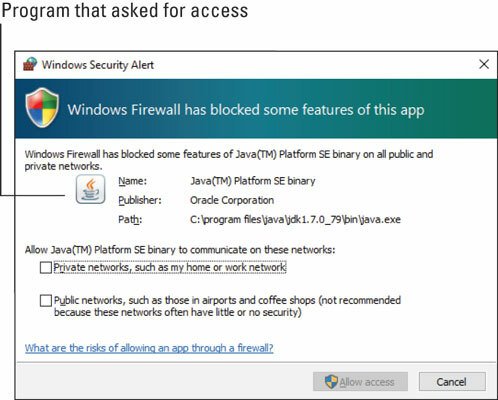 You see firewall warnings on your Windows PC during one of two situations. First, because you’re using a new program that accesses the Internet. Second, because something sneaky is trying to access the Internet or get into your computer from the Internet. In both situations, the firewall is unfamiliar with what’s going on, so you’re warned. Did you just start that program or do something that caused the program to ask for access? If so, allow the access. If not, deny access. For example, if you’re running an online, multiplayer game for the first time, you may see the firewall warning. That’s an allowed use. On the other hand, if you see the firewall warning and don’t recognize the program or you’re not doing anything that requires Internet access, block the program. • When you allow a program through the firewall, it won’t ask again. That’s because you created a new firewall rule that allows the program Internet access. • You can unblock a program if you learn later that it’s legitimate.